NOW NATIONAL: Story in the Public Square TV and radio broadcasts year-round from our flagship station, Rhode Island PBS, in Providence, Rhode Island, bringing some of America's finest non-fiction and fiction authors, filmmakers, journalists, still photographers, scholars and others to television, the Web and nationally and internationally on SiriusXM Satellite Radio. We also podcast every episode on iTunes, Spotify and other channels. And we were honored to receive a Telly Award for Best Political / Commentary in Television in the 39th annual awards. Following the September 2018 coast-to-coast launch, the program is now carried in 22 of the top 25 markets in America, 43 of the top 50, and 83 of the top 100, as of this writing. I co-host and co-produce and also edit many episodes. Find your local station. The moon had set, leaving only stars above as Friday, June 26, 2015, began. Dawn was nearing when Mark Gonsalves, 44, left his apartment near the Newport end of the Pell Bridge and got into his car. Leaning on the gas, he sped onto the span. Were he to jump, his body would rapidly accelerate, reaching about 81 miles per hour when he hit the surface in a journey lasting just over three seconds. He would cause a splash, but the sight and sound of it would be lost in the night. Gonsalves jumped. A quite remarkable story, four months in the making, told in words, photographs, videos and podcasts. A story a day in the month of May 2018: a retrospective of some of my non-newspaper work timed to coincide with my first major sale of a fiction piece, which was published in May 1985. Every day in May 2018, I published an excerpt or an entirety of a work produced away from the day job from 1985 through 2018, roughly in chronological order, and with background as appropriate: short stories, books, screenplays, treatments and films. Some were previously published, others not. So some days, you could look into the trunk. Thirty-three years ago, #33Stories. A bit contrived, yes. A bit interesting, hopefully. Of course, May has 31 days. I published no. 32 on June 1, and no. 33 on June 12, a day of particular significance to me. READ! Go to the table of contents for #33Stories. In 2011, I wrote THE WAR ON TERROR: Coming Home, a Providence Journal series, my 16th, on veterans of the wars in Iraq and Afghanistan. The documentary from the series, COMING HOME, won a regional Edward R. Murrow Award and was nominated for a New England Emmy. Another public-service initiative in which I played a key role is The Journal's 2012 examination of the ailing Rhode Island economy in the Reninvent Rhode Island series. In February 2013, we published a 12-day commemorative series marking the 10th anniversary of The Station nightclub fire that killed 100; The Journal was a finalist for the 2004 Pulitzer Prize in Public Service for its coverage of the tragedy. In 2013, we published #eWave: The Digital Revolution, a continuing series about the impact of technology on our lives. Our 2014 contribution was Middle Class Squeeze, another year-long look at the economy through the prism of personal stories and an election year. Our 2015 effort was Race in Rhode Island, an in-depth exploration of one of the most pressing issues of our time. Started in 2014 and continuing into 2017: Mental Health in Rhode Island. I am visiting fellow and director and co-founder of the Story in the Public Square initiative at Salve Regina University's Pell Center in Newport, R.I. This year-round program to study, celebrate and practice storytelling in American politics and culture was established in 2012 and formally launched with a day-long conference on April 12, 2013, featuring former U.S. Sen. Gary Hart and two-time Pulitzer winner Dana Priest, of The Washington Post. The second-annual Story Day, on April 11, 2014, was also a great success. Our theme was Moving Images, featuring Pell Prize winner and keynote speaker Danny Strong, the Emmy-winning actor, producer and screenwriter of The Butler, Recount, Game Change and the Mockingjay Hunger Games finale. In June 2015, we honored best-selling author Lisa Genova with the third annual Pell Center Prize for Story in the Public Square. Our fourth annual winner was Pulitzer- and World Press Photo-winning war photographer and documentary filmmaker Javier Manzano, who received his award in Newport on June 21, 2016. Our fith winner was Oscar-nominated and peabody-winning documentary filmmaker Daphne Matziaraki, who received her award in Newport on June 5, 2017, and appeared on Story in the Public Square TV and Radio the weekend of June 24, 2017. Pulitzer-winning New York Times staff writer and bestselling author Dan Barry was our 2018 winner and he appeared on Story in the Public Square the weekend of May 5, 2018. 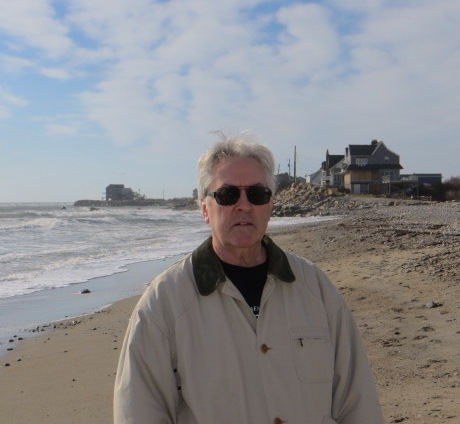 I write and produce feature-length documentaries, including ON THE LAKE: Life and Love in a Distant Place, about the tuberculosis epidemic of 1900s America and globally today, nominated for a New England Emmy and broadcast nationally on PBS, and BEHIND THE HEDGEROW: Eileen Slocum and the Meaning of Newport Society, about today's old-money Newport, a world whose roots lie in the Gilded Age of Vanderbilts and Astors, also aired on PBS. The third documentary I wrote and co-produced is COMING HOME, based on my Fall 2011 Journal series. It premiered online Dec. 29, 2011, and was broadcast on Rhode Island PBS March 26, 2012, and later dates. Coming Home won a regional Edward R. Murrow Award and was nominated for a New England Emmy. In the short-documentary category, I shoot, edit and produce a variety of films, on such major topics as Alzheimer's disease and neuroscience research, and less-significant (but nonetheless entertaining!) things as jelly fish meet autos, antique cars, and 'Proof of Heaven,' shot at some 30,000 feet. Not really proof of heaven... or is it?! All are on my YouTube channel. On February 13, 2016, Story in the Public Square debuted on national and overseas public television as a monthly feature of the long-running show White House Chronicle. In the inaugural show, Pell Center head Jim Ludes and I, cohosts, discussed the stories and storytellers who were interviewed, starting with bestselling author August Cole the weekend of March 5, 2016, and Pulitzer Prize-winning author and New York Times staff writer Dan Barry the weekend of March 26, 2016. Links to subsequent broadcasts, including Hasbro CEO Brian Goldner, Brown University professor of Africana studies and hip-hop author Tricia Rose, Javier Manzano, and Raina Kelley, of ESPN's The Undefeated, can be found here. This was the precursor to the 2017 Story in the Public Square PBS TV and SiriusXM Satellite Radio, now nationally broadcast. In my work, I have been privileged to receive access to significant people who are not always -- if ever -- accessible to all. Only a percentage of information they have shared with me makes it into my books and movies, so in the interests of open scholarship, I have donated hundreds of my original and exclusive taped interviews to historical organizations that will preserve them for others. My NASCAR collection is housed at Appalachian State University's Belk Library in Boone, North Carolina. My Newport Society collection is at The Redwood Library & Athenaeum in Newport, Rhode Island. My medical pioneers collection is at The Center for the History of Medicine, at the Harvard Medical School's Countway Library of Medicine in Boston. And in 2013, I donated some of my remaining archival material, including materials from my book KING OF HEARTS, my Frank Beazley series, The Growing Season and my documentary ON THE LAKE to the University of Rhode Island Library Special Collections and Archives department. LATEST FICTION DROWNED: A Different Kind of Zombie Tale, sequel to the Thunder Rise trilogy, from Cross Road Press, publisher of my mystery, horror, sci-fi and other fiction. Published on August 17, 2015, week of NecronomiCon Providence. HUMAN HANDS NOW DIGITAL AND AUDIO The Los Angeles Times called THE WORK OF HUMAN HANDS: Hardy Hendren and Surgical Wonder at Children's Hospital "A song of suffering and redemption that is harrowing to read and impossible to forget." Updated to autumn 2012, with all-new introduction, epilogue and photos, from Crossroad Press. TOY WARS, THE E-EDITION TOY WARS: The Epic Struggle Between G.I. Joe, Barbie, and the Companies That Make Them is also now digital. ALSO AVAILABLE The second edition of Top Brain, Bottom Brain: Surprising Insights Into How You Think. Details here. For the G. Wayne Miller bibliography and videography, click here.